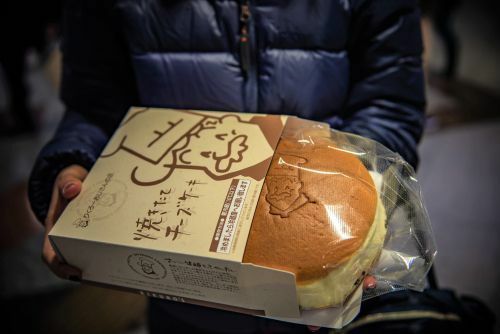 If you have the chance to visit Osaka, there is an unavoidable cheesecake you can only buy there. The name of the shop is "Rikuro Ojisan" or "Uncle Rikuro" and there are several locations in Osaka. Not only locals but visitors are going crazy for this fluffy cheesecake! Once you try it, you'll understand why..
Rikuro Ojisan (りくろーおじさん) is a shop specialized in fluffy baked cheesecakes. They are one of the most famous cheesecakes in Japan, although only available in Osaka. 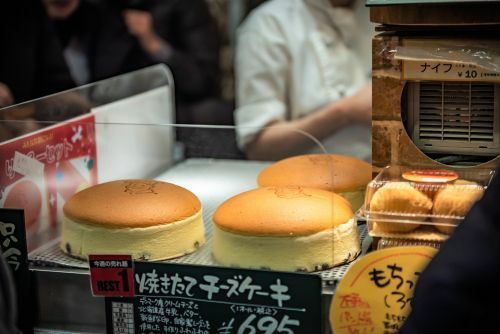 When visiting Osaka, a lot of people make the detour to try this unbelievable cheesecake. They sell freshly baked cheesecakes that are extremely soft and fluffy. The texture is so incredibly smooth. They also use a selected cheese imported from Denmark, high-quality milk and butter from Hokkaido, which creates this unmatchable creamy taste. There are 11 shops in Osaka, the very first shop is in a shopping area near Namba station. Some of them including the first shop have a cafe where you can enjoy the freshly baked cheesecake, and others only offer cheesecakes for take-out. They offer one kind of cheesecake that is as cheap as 675 yen, definitely the best value for money. The cheesecake has dried raisins on the bottom, which go really well with the cheese flavour and add a fine texture. Almost all people come for their cheesecake, but they also have other cakes and desserts if you want. All of them are priced reasonably; a slice of strawberry shortcake is 325 yen. Try the heavenly cheesecake in Osaka! Don't miss the special cheesecake when you come to Osaka. It is so delicious that you just might be able to finish the whole cake in one sitting!